BEN Buchele has been working since 1931 with electric drive technology to meet industrial requirements. Nowadays, run by the third generation of the family who founded the company, we manufacture electric low-voltage machines based on custom and special designs for a variety of industries. Our production currently includes motors in a power range from 0.25 up to 1,300 kW (based on the statistically common standard speed). In addition to our own products, we also sell electrical equipment and accessories for specific applications. We are continually developing our motor technology in order to enhance and improve quality, performance and possible applications. To help us do this, we closely monitor the basic research published in the field so that we can provide our customers with advanced technology. Equipped with the knowledge obtained from this, we carry out further development work to meet our customers’ individual requirements. Thanks to the ongoing improvements made in our products, our “Made in Nuremberg” motor technology is now used around the world every day. In 1931 Hans Buchele and Josef Edelmann founded a workshop in Nuremberg, under the name “Buchele & Edelmann”, for repairing electric machines and appliances, along with an electrical wholesaler. Three years later the company began manufacturing DC, three-phase and AC electric motors. In 1939 a branch factory was opened in Moosbach near Feucht, Germany. Since the company was founded, Grete Buchele worked alongside her husband, in charge of the accounts. During the Second World War, the company was obliged to supply specially designed DC motors and generators for submarines. Immediately at the end of the war, the company’s founders went their separate ways, with the company’s name changing to “Hans Buchele Elektromotorenwerk Nürnberg”. In the early years after the war, repair works formed the basis for the company’s relaunch. This period also coincided with the remaining DC networks permanently switching to three-phase current, which increased the demand for many three-phase and AC motors. Production expanded to include DC motors, single-phase AC motors and three-phase motors with squirrel-cage and slip-ring rotors, with outputs of up to 10 kW (at 1,500 l/min. ), as well as push-buttons and three-phase air-break contactors. The company purchased the premises which are still used to day in Poppenreuther Straße, Nuremberg. In 1952 Hans Buchele’s one-man firm became B.E.N. Hans Buchele Limited Partnership. The reconstruction going on in West Germany and the start of export activities boosted the expansion of the production range where the focus was on low-noise and pole-change motors for fan drives. Agencies in Germany and abroad expanded the sales areas. In 1956 Hans Buchele’s son-in-law Bert Schwegler joined the company to provide him with support in running the business. From 1959 the standardisation of three-phase motors required the development of new motor ranges. In 1961 another major task was achieved: the renovation work on the old factory building was completed. This was also a period of continuing technological development. The BD series jacket-cooled motors gradually made way by 1962 for the KD series surface-cooled motors. This was accompanied by the expansion of the frame size range under IEC and DIN standards to size 315. In 1965 outputs of 200 kW (based on 1,500 l/min.) were reached. The first motors were delivered for use on board ships. 1965 also saw the founding of BEN Buchele Elektromotorenwerke GmbH, which took over the manufacture and sale of motors and switchgear, as well as the staff from the limited partnership company. B.E.N. Hans Buchele KG continued to operate, with its job being to manage and lease economic assets and property to BEN Buchele Elektromotorenwerke GmbH. In 1968 Monika Schwegler-Buchele, the founder’s daughter, joined the company to provide support in running the business. There was cause for great joy in the summer of 1970 as the company celebrated the manufacture of its 500,000th motor. And the company continued to grow. The manufacture of custom-design motors for the shipbuilding sector began to make further advances thanks to the sales activities of the Hamburg office. The same was true for the production of slip-ring rotor motors for lifting machinery and of ship motors to be installed on the upper and lower decks – all of which made it necessary for the company’s site to be expanded. The company’s founder and his wife retired from the executive board. Monika Schwegler-Buchele and Bert Schwegler assumed complete responsibility for running the company. In 1985 the repairs department, which had been an integral part of the company until then, became an independent company, run under the name of Buchele Elektrotechnik GmbH. In 1988 a further milestone was reached: the 750,000th motor left the factory. 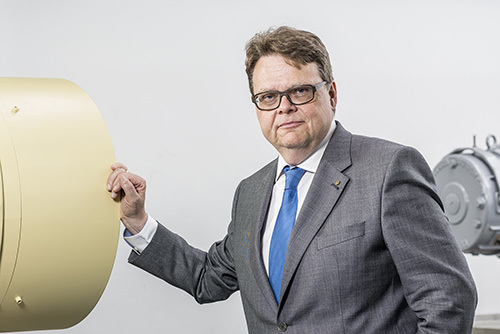 In 1989 Hans-Peter Schwegler, the company founder’s grandson, joined the company to provide support to the executive board. Not long before the start of the new millennium, the 355 and 400 frame sizes were added to the motor range, which meant that outputs of up to 1,300 kW could now be achieved (depending on the protection category, operation mode and rotational speed). BEN Buchele developed a new motor concept for underwater operation, which also had an innovative plug connection system. In the 2000s the development of custom motors for platform hoisting equipment on oil and gas drilling platforms successfully ensured a strong entry into the offshore sector. Several drilling platforms a year were equipped with motor technology from Nuremberg. After working for the company for many decades, Bert Schwegler left the executive board in 2003, but remained as an adviser to the company. The growing demand for frequency controlled motors and the modifications required to fulfill the energy efficiency rules reflect the volatility of the market. However, BEN Buchele is prepared to meet these requirements. Our new state-of-the-art test station which gives extensive test options is about to start operation beginning of 2017. BEN Buchele is also in a good position to face the future. Our company currently enjoys a strong reputation among many customers in Germany and abroad and is regarded as an expert partner for a variety of drive solutions.